Read our helpful guide to second hand Vauxhall Movano. AA Cars works closely with thousands of UK used van dealers to bring you one of the largest selections of Vauxhall Movano vans on the market. 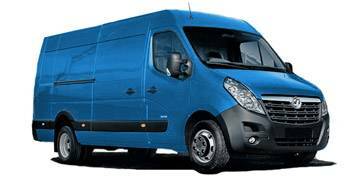 You can also browse Vauxhall dealers to find a second hand van close to you today. All used Vauxhall Movano on the AA Cars website come with free 12 months breakdown cover. A re-badged Renault Master, the Vauxhall Movano is one of the largest vans in the manufacturer's range, and since its release in 1998, has been a staple of the 3.5 tonne van sector. Later generations and models has seen the Movano grow increasingly efficient and powerful, and now featuring common rail powerplants in 1.9, 2.2 and 2.5 litre engines, drive is smooth and relatively economic. On the road the drive is good, and nimble handling and a comfortable ride make it relatively dynamic. Load space of up to 14m3 and payloads of between 1,047kg and 1,705kg make it a serious workhorse too, and so if its comfortable practicality you're looking for, there are few as capable as the Movano.